4-Word Review: Private school is murder. The film opens right away with a nice creepy tone and a foreboding score that immediately got me wrapped up into it. The dark, shadowy lighting of the interiors helped accentuate the sinister feel. It is also great to have the film shot in an actual boy’s school instead of building sets to recreate the look. Just hearing the floorboards creak underneath the feet of the actors as they walk around helps to create an already strong atmosphere. Mason is terrific. I think it is impossible for the man to ever give a weak performance even if the script itself is poor. He is captivating every time he is on the screen and his ability to display wide ranging emotions without flaw never ceases to amaze me. Everything always seems to come so naturally with this man in all of his performances that you never see the acting, or technique behind it. It is a shame this movie is so obscure because watching his performance alone makes the film worth seeing and the desperate, lonely character that he plays is interesting in its own right. Preston doesn’t seem as strong. He is a good actor at times, but not for this type of part and having him wearing a moustache doesn’t help. Supposedly the part was originally intended for Marlon Brando, who would have been more interesting, but he ended up backing out. Bridges is okay as the protagonist, but he has played the role of a wide-eyed idealist coming into an ugly situation while oblivious to all of the dark aspects a little too often making it an annoying caricature. The movie fails in the fact that it cannot hold the tension and there are too many talky scenes with little action in-between. The students come off as robotic like and the scenes involving them attacking another student inside a gymnasium looks staged and rehearsed. Director Sidney Lumet would have done better had he used a hand-held camera and gotten right in the middle of the fray making it seem more spontaneous and vivid. I also had a hard time believing that so many students could get effectively brain washed and sworn to secrecy. I could buy maybe a few, but having so many seemed implausible and ruined the film for me. However, the explanation for the cause to the violence is an original one that I wouldn’t have thought up myself. Also, the surprise twist at the very end is kind of cool. 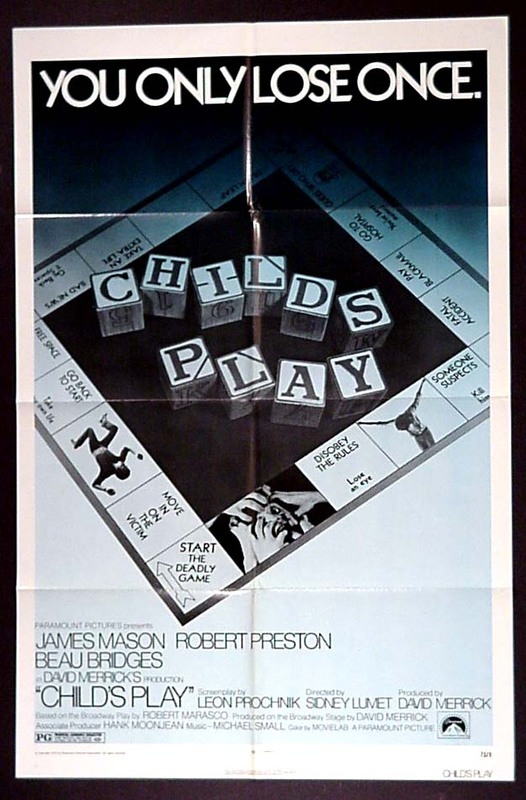 A similar film to this one entitled Unman, Wittering, and Zigo that also came out in the 70’s and dealt with murder at an all-boys private school will be reviewed next Friday and fares a bit better. This entry was posted in 70's Movies, Adolescence/High School, Movies Based on Stageplays, Mystery, Obscure Movies, Thrillers/Suspense and tagged 70's Movies, Drama, Entertainment, lonely character, Marlon Brando, Movies, oscars, random acts of violence, Review, robert marasco. Bookmark the permalink. Haven’t heard of this – love that it was based off a play – I’d dig seeing the play. Yeah, the stage version of this was more successful. It ran for 342 performances and was nominated for a Tony award for best play of 1970.